The beautiful community of Summerhouse is a condominium complex that resides in Litchfield by the Sea in Litchfield, South Carolina. The condo complex is four stories tall and many of the units have beautiful views of the lakes. Residents get to enjoy all of the great amenities that are located in Litchfield by the Sea. Every condo in the community is a 1 bedroom unit and they come in just under 600 square feet of space. Residents love this community because it’s only a short walk to the beach. 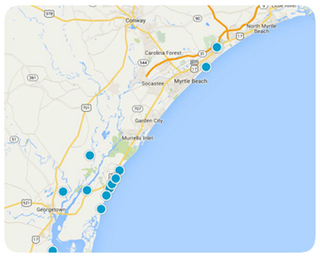 You are also near Murrells Inlet and Huntington Beach State Park. There are many areas for residents to enjoy shopping, dining, entertainment, nightlife, golf, and outdoor recreation. Residents are also close to all of the amazing attractions that are located in the Myrtle Beach area. Feel free to take a look at the beautiful condos we have available and let us know if you have any questions or interest.